Bought this shirt from New Look quite a while ago now, I really liked the scalloped detail as I thought it was pretty unusual for a high street item, the quality felt really nice too for a sheer shirt. Some of them are so weird and scratchy! The colour sort of put me off, as you all know I like wearing pink, I just dont generally like pale colours as they wash me out. I was in two minds about returning it, but thought I'd give it another go. Just wore my Zara skirt with scallopped detail skirt. Lovely. I got my train tickets for Leeds earlier so I'm heading up to see Victoria tomorrow! I'm super excited, Joint outfit posts ftw! Lovely shirt! I saw a similiar one on ASOS, only it was twice the price. I really like the shirt! I would never wear it myself though, like you I don't really 'do' pale colours. Im ghostly white and ginger! i love the shirt and think you look great! I think you look great! :) I really love the scallop details as well as the collar. Have you re ombred your hair? It looks lovely! 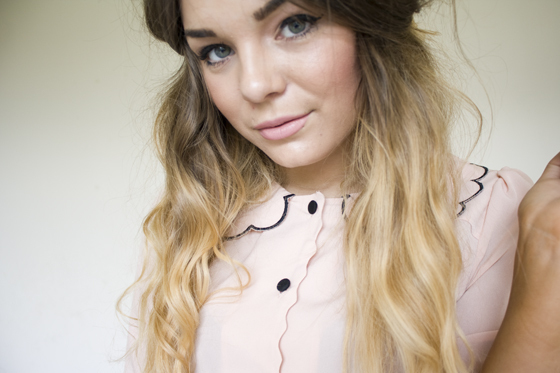 Your top has the cutest collar!! I love the shirt, and your hair looks lovely like this. 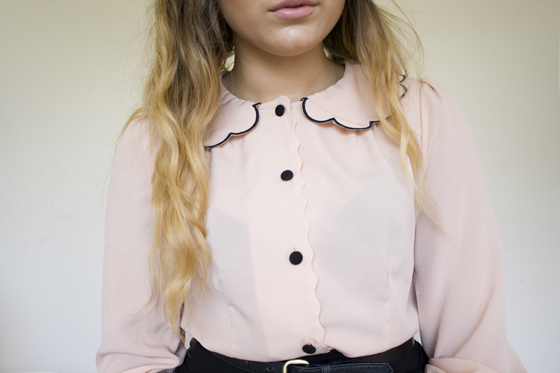 That shirt is lovely, the collar is so cute! It doesn't look like it's from New Look at all! Nah I think the pale pink works well on you, looks quite feminine. Also, love that song! have a great time tomorrow ! How cute are all the scalloped detail?! And I think the blush hue looks fantastic on you. Your hair looks so lovely! I'm glad you didn't return the shirt, it looks beautiful on you. And I adore your lipstick! LOVE the shirt. You look gorgeous! I love that shirt! Your hair is beautiful! I love the blouse. The colour is so nice. a little preppy and really cute. love your shirt! i love how girly this look is. love the blouse. Loving ur hair curly too, im considering buying the babyliss curling wand! Love the shirt! Saw a scalloped one in Topshop today! I love this glamour look! That shirt is gorgeous! I was dead shocked to see it was from New Look. I love your hair curly and the blouse is beautiful! I like the blouse! it's so cute and the outfit looks cute and smart! The shirt is just so lovely - wouldn't have thought of New Look! Gorgeous shirt.. looks amazing on you! The detail on it is perfect.. and looks a lot more expensive than high street! wow that shirt is amazing, it doesn't look like New Look stuff at all! I love your skirt and rings also! Your shirt's lovely! I never really got into the scallop detail craze but when I see it on people I do think it's quite cute. Maybe I just don't like them on me, I think you have to have a very feminine look to pull it off.. Looking forward to your posts from Leeds, have a great time! This is definitely one of my favourite outfits you've posted on here! That shirt is GORGEOUS and I can't believe it was from New Look, amazing! Cute outfit!! :D Love your hair! p.s. yay for albert hammond jr! Love the shirt Lily.. its so pretty. This outfit so smart and chic, oh and your hair looks beautiful. i need to pick myself up that top! 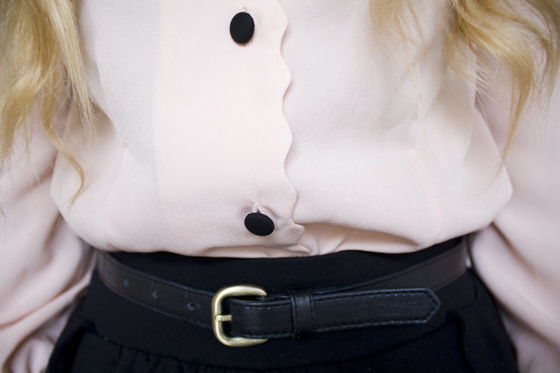 That shirt is very cute, love the scalloped edges and contrasting buttons! THAT COLLAR! So good. Also, that light pink really complements your light hair! just discovered your blog and had a read of it, love it! your amazingly beautiful too! Saw you in look magazine and couldn't quite place how I had seen you before. Then realised I follow you on lookbook. Love your style so much! just to let you know i bought the jumper from h&m, the brown and turquoise one from last week! thanks a lot cause i fell in love with it! I loooove this shirt. It's really cute. Yours is different from the one on the New Look site (I like yours better) but it's cute all the same. love your look as norm! Your hair looks fab! -have you redip dyed? Oh Lily, that shirt is absolutely beautiful! Ah! Your hair looks delicious! Lovely outfit ;) Your hair is so amazing! Lily, your hair looks so nice! This top is beautiful! I love the color and the details!